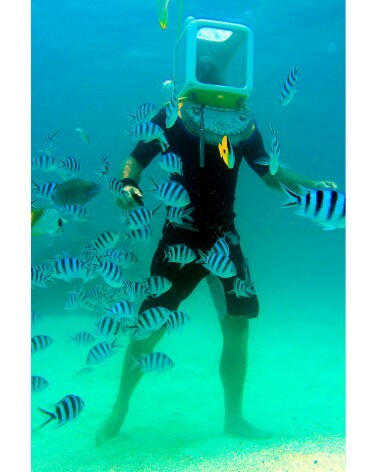 Make the Underwater walk, helmet diving the highlight of your trip! No need to know how to swim, snorkel, or scuba dive to go for an unforgettable experience in the lagoon of bora bora! After some explanation and a short safety briefing (available in different languages) ​​*** you will be ready to explore the world of némo in the coral garden. More information and excursion tour details. Why dive with us ? Free transfer to and from the hotel to the activity. We take care to pick you up at your hotel, bus or boat. The voucher (booking) will be sent by email, simply let us present the day of the activity. Include the lagoon boat tour and transfert. No need to know how to swim, snorkel, or scuba dive to go for an unforgettable experience in the lagoon of bora bora! After some explanation and a short safety briefing (available in different languages) ​​*** you will be ready to explore the world of némo in the coral garden. 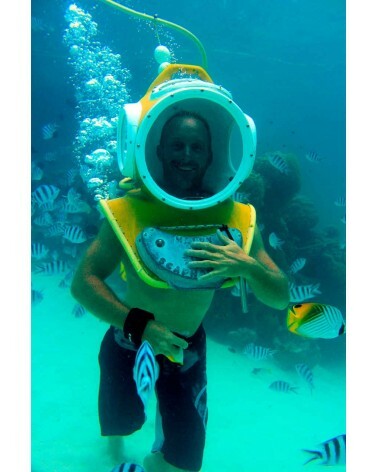 A dive helmet placed on your shoulders, you will breath normal without getting your head wet. You will go under water for thirty minutes. Bring your entire family and your children to walk at three meters deep with the rest of your group! In crystal clear water and in the middle of the coral reef garden, a qualified suba diver instructor will guide you to an unforgettable ride underwater! This is the best way to discover a multitudes of tropical fish and ray. 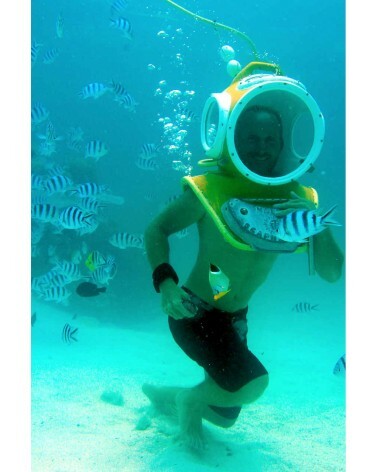 It's even easier than snorkeling. With a high definition camera, a professional, take some pictures during your dive. This awesome memory will be proposed at the end of the activity tour excursion boat. 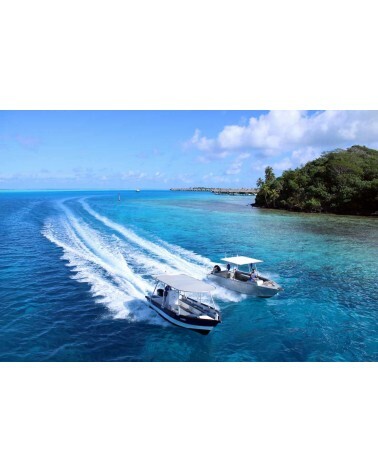 Free pick up, boat transfert and drop off from your accomodation! Activity time: about two hours, including a half hour under water (max 4 pax). Born in 1995, Aqua Safari Bora Bora is a family business! 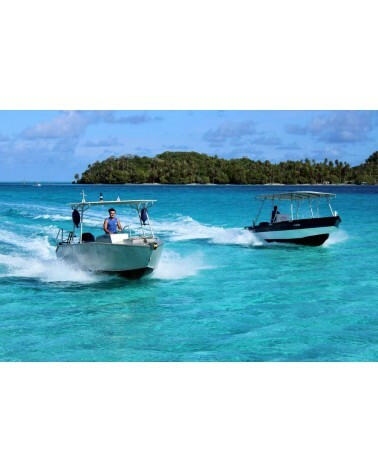 Flagship activity in the lagoon of Bora Bora, we address primarily the beginner, but not only! Whatever your language, we offer you a few hours of dream in one of the most beautiful lagoon in the world!